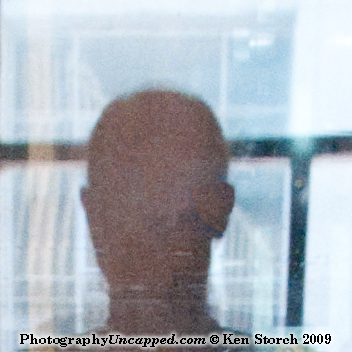 All self portraits are self reflective, obviously, but using reflections photographically for this purpose can add an interesting layer, or more, for photographers and viewers as well. Taking pix of one’s own reflection is a common pastime for many photographers. I’m suggesting here that the reflection can carry a deeper metaphoric value as a self portrait. The location, surface, background, or underlayer, of the reflection carries content possibilities. The image below I shot while traveling in Venice, Italy during one of their coldest winters on record. It tells a bit about the season, and maybe the location, and perhaps a hint of my waist-level handheld technique ;> ) but not much about me really. The next image was shot in a medical building in Bangkok, Thailand. The location is not really apparent in the image, nor is my ‘technique’, but it has a layer that says something about me personally. When I was young (5-13 years old) I had what seemed then to be mutually exclusive life interests. Science and Art. Some of my inspirational figures were Albert Schweitzer, George Washington Carver, Marie Curie, Vincent Van Gogh, Michelangelo, and Salvador Dali. Along my life’s way, the Art side flourished because of the perceived freedom of its realm as opposed to the seemingly too tight constraints of, not so much science itself but, the world of Science scholarship. Lo, and it came to pass, that much of my creative work has been in the technically complex world of photography with all its attendant hardware limitations. One of my greatest treasures as a kid was a cheap microscope. It came as a subscription perk along with a series of science-related books for kids. My parents scraped up enough to at least start the subscription at a time when household income was very low, and I’m sure it was an additional hardship during their tough times. The reflection in the image is on the surface of a cabinet filled with the actual microscopes of doctors significant in the medical history of Thailand. 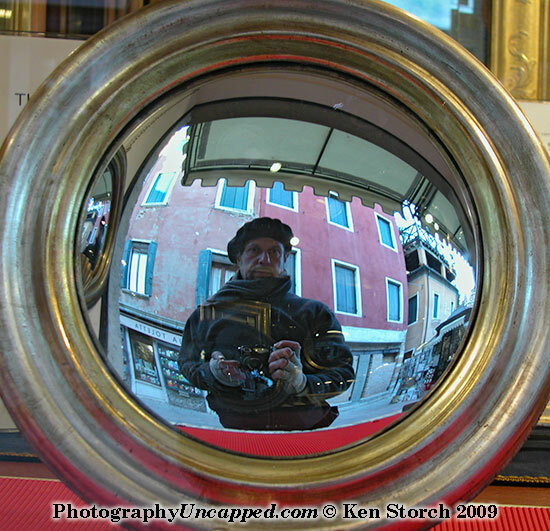 As a photographic metaphor, seeing a ghost-like image of me seemingly set back in this cabinet says more about me as a persona than the above image in the mirror in Venice. I’m suggesting to photographers and artists to use reflections to add layers of personal content in your work. The idea is not mine, and certainly not new, but bears mentioning again once more. 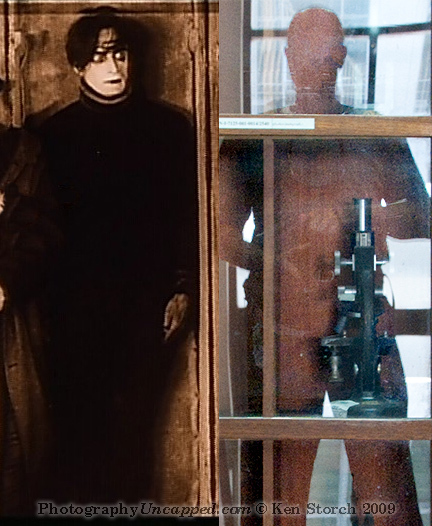 The title of the image, “The Microscopic Cabinet of Dr. Kenny” is a play on the artfully complex, iconic, and seminal movie “The Cabinet of Dr. Caligari”. For those who are metaphorically challenged, that isn’t me on the left. Great article. I’m convinced of the link between art and science, both purveyors of them are the observers of the world, creative in their approaches, and open to all possibilities. By the way, that’s quite a “telescope” you have on you in the Caligari shot, have you been holding out on the women/woman in your life?? I think doing self-portraits is an almost necessary part of being a photographer, but I struggle with the format. I want to create an expression of me, a description of me, but I battle with the “all about me” concept. The self-masturbatory aspect of it. Any suggestions????? woops, sorry, I mean a microscope, not a telescope. Small worlds, big worlds, guess they are really the same. There should have been an ‘edit’ option in your browser view of your post to correct your Freudian ‘telescope’ reference. As to the ‘self’ issues, aren’t all art efforts self-masturbatory? I think the artist has an inherent disturbance that requires some action of self. In the simplest manifestation, to pick up a stick and scratch in the dirt. The artist ‘needs’ to see some manifestation of self in all endeavors. In the endless task of defining ‘art’ or ‘artist’, this aspect currently figures in my definition. so, mr. big words, are you saying it’s ok to shoot myself and not feel like a narcissist? Well, as a performance piece, shooting oneself has been done. But, if you do, please make sure to get it on camera for your 15sec. of tube fame.